In the mid 80’s, Hirotaka Takeuchi and Ikujiro Nonaka defined a flexible and all-inclusive product development strategy where the development team works as a unit to reach a common goal. They described an innovative approach to product development that they called a holistic or “rugby” approach, “where a team tries to go the distance as a unit, passing the ball back and forth.” They based their approach on manufacturing case studies from various industries. Takeuchi and Nonaka proposed that product development should not be like a sequential relay race, but rather should be analogous to the game of rugby where the team works together, passing the ball back and forth as they move as a unit down the field. The rugby concept of a “Scrum” (where a group of players form together to restart the game) was introduced in this article to describe the authors’ proposal that product development should involve “moving the Scrum downfield”. 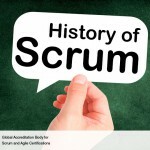 Ken Schwaber and Jeff Sutherland elaborated on the Scrum concept and its applicability to software development in a presentation at the Object-Oriented Programming, Systems, Languages & Applications (OOPSLA) conference held in 1995 in Austin, Texas. Since then, several Scrum practitioners, experts and authors have continued to refine the Scrum conceptualization and methodology. In recent years, Scrum has increased in popularity and is now the preferred project development methodology for many organizations globally. Why should we adopt Scrum? How does customer collaboration weigh over contract negotiation?